Reg Byrd has been a business venture strategist for over 25 years assisting entrepreneurs in all aspects of business development with a focus on financing, business plan development, build of financial projections and blueprints for aggressive return on investments. The scope of his work ranges from sole proprietorship businesses to capital intensive Fortune 500 hotel development projects, acquisitions and dispositions. Securing debt being his forte, he has been successful in placing nearly one-billion dollars in debt; vis-à-vis relationships with traditional and non-traditional lenders using SBA-guaranteed financing products, real estate investment lending, fixed asset programs, and bridge financing to name a few. Reg Byrd is known as the “master” within the franchise community when it comes to SBA financing. In 1980, he began working in the hotel business, first for Holiday Inn, Inc. and then recruited by ITT Sheraton in 1984. In 1990 he was recruited by Hyatt Hotels as Financial Controller. Mr. Byrd called Hyatt Hotels home for more than a decade. While with Hyatt he worked at three of their Southern California properties: The Westlake Plaza, the Regency Long Beach, and the Regency La Jolla. Given the opportunity for advancement, Reg Byrd was scooped up by Loews Hotels to serve as CFO at the Loews on Coronado in San Diego. He has been responsible for budgets over $55,000,000. One with the spirit and soul of an entrepreneur, he left corporate America in 2004 to launch his own company. Being a California licensed real estate broker, he began representing hotel owners around the country. His portfolio of brokered transactions range from $500,000 to $30,000,000. Reg Byrd ’s success in closing escrow on hotel transactions had a direct correlation with his skill in securing debt for his clients. For over the last decade Mr. Byrd’s business organically evolved by accumulating all franchise systems, not just hotels. 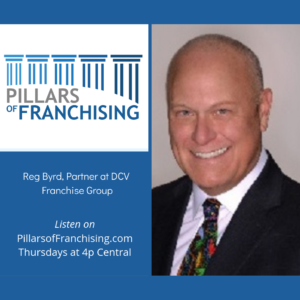 To date, DCV Franchise Group has served more than 400 franchise systems placing debt for franchisees exceeding $1.7 Billion. Working with individuals seeking business ownership for the first time is rewarding for Reg Byrd. This is directly reflected by taking on funding assignments of all amounts; there is no deal too small. His ability to maneuver through highly complicated, multi-partnership projects comes as second nature. Financing transactions of all categories find a place with Mr. Byrd. His objective is to guide his clients, so they arrive financially safe, so they can grow their enterprise. Reg Byrd is published regularly in franchise, finance and business periodicals. He has contributed in discussion panels over the years and enjoys being a guest speaker at conferences and forums. Supported by an incredible team of business development staff, underwriters, business plan copywriting team, lending officers and financial modelers, DCV successfully represents and secures financing for entrepreneurs at varying stages in business; startups and expansions alike. Mr. Byrd is firmly committed to excellence without mediocrity.